We have repeated how little is asked of you to learn this course. It is the same small willingness you need to have your whole relationship transformed to joy; the little gift you offer to the Holy Spirit for which He gives you everything; the very little on which salvation rests; the tiny change of mind by which the crucifixion is changed to resurrection. And being true, it is so simple that it cannot fail to be completely understood. Rejected yes, but not ambiguous. And if you choose against it now it will not be because it is obscure, but rather that this little cost seemed, in your judgement, to be too much to pay for peace. Deceive yourself no longer that you are helpless in the face of what is done to you. Acknowledge but that you have been mistaken, and all effects of your mistakes will disappear. It is impossible the Son of God be merely driven by events outside of him. It is impossible that happenings that come to him were not his choice. His power of decision is the determiner of every situation in which he seems to find himself by chance or accident. No accident nor chance is possible within the universe as God created it, outside of which is nothing. Suffer, and you decided sin was your goal. Be happy, and you gave the power of decision to Him Who must decide for God for you. This is the little gift you offer to the Holy Spirit, and even this He gives to you to give yourself. For by this gift is given you the power to release your saviour, that he may give salvation unto you. Begrudge not then this little offering. Withhold it, and you keep the world as now you see it. Give it away, and everything you see goes with it. Never was so much given for so little. In the holy instant is this exchange effected and maintained. Here is the world you do not want brought to the one you do. And here the one you do is given you because you want it. Yet for this, the power of your wanting must first be recognised. You must accept its strength, and not its weakness. You must perceive that what is strong enough to make a world can let it go, and can accept correction if it is willing to see that it was wrong. The world you see is but the idle witness that you were right. This witness is insane. You trained it in its testimony, and as it gave it back to you, you listened and convinced yourself that what it saw was true. You did this to yourself. See only this, and you will also see how circular the reasoning on which your ‘seeing’ rests. This was not given you. This was your gift to you and to your brother. Be willing, then, to have it taken from him and be replaced with truth. And as you look upon the change in him, it will be given you to see it in yourself. Perhaps you do not see the need for you to give this little offering. Look closer, then, at what it is. And, very simply, see in it the whole exchange of separation for salvation. All that the ego is, is an idea that it is possible that things could happen to the Son of God without his will; and thus without the Will of his Creator, Whose Will cannot be separate from his own. This is the Son of God’s replacement for his will, a mad revolt against what must forever be. This is the statement that he has the power to make God powerless and so to take it for himself, and leave himself without what God has willed for him. This is the mad idea you have enshrined upon your altars, and which you worship. And anything that threatens this seems to attack your faith, for here is it invested. Think not that you are faithless, for your belief and trust in this is strong indeed. The Holy Spirit can give you faith in holiness and vision to see it easily enough. But you have not left open and unoccupied the altar where the gifts belong. Where they should be, you have set up your idols to something else. This other ‘will’, which seems to tell you what must happen, you give reality. And what would show you otherwise, must therefore seem unreal. All that is asked of you is to make room for truth. You are not asked to make or do what lies beyond your understanding. All you are asked to do is let it in; only to stop your interference with what will happen of itself; simply to recognise again the presence of what you thought you gave away. Be willing, for an instant, to leave your altars free of what you placed upon them, and what is really there you cannot fail to see. The holy instant is not an instant of creation, but of recognition. For recognition comes of vision and suspended judgement. Then only it is possible to look within and see what must be there, plainly in sight, and wholly independent of inference and judgement. Undoing is not your task, but it is up to you to welcome it or not. Faith and desire go hand in hand, for everyone believes in what he wants. We have already said that wishful thinking is how the ego deals with what it wants, to make it so. There is no better demonstration of the power of wanting, and therefore of faith, to make its goals seem real and possible. 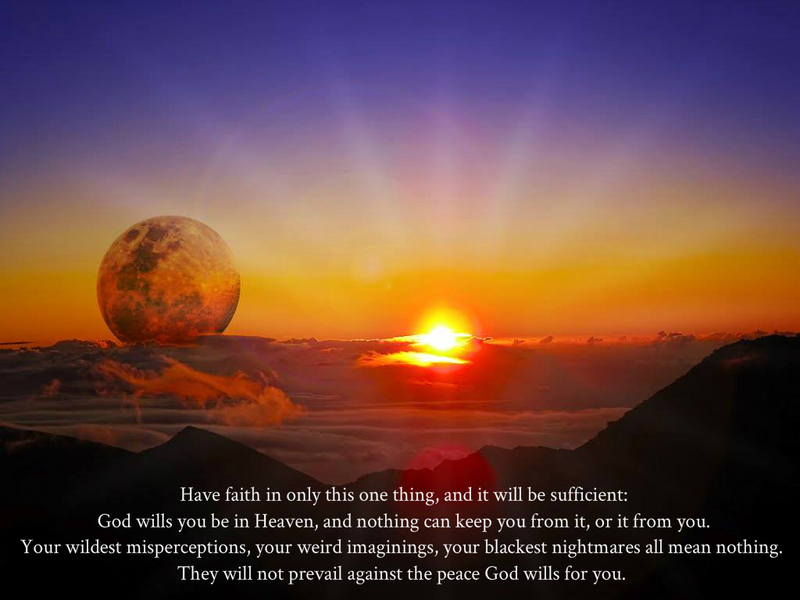 Faith in the unreal leads to adjustments of reality to make it fit the goal of madness. The goal of sin induces the perception of a fearful world to justify its purpose. What you desire, you will see. And if its reality is false, you will uphold it by not realising all the adjustments you have introduced to make it so. When vision is denied, confusion of cause and effect becomes inevitable. The purpose now becomes to keep obscure the cause of the effect, and make effect appear to be a cause. This seeming independence of effect enables it to be regarded as standing by itself, and capable of serving as a cause of the events and feelings its maker thinks it causes. Earlier, we spoke of your desire to create your own Creator, and be father and not son to Him. This is the same desire. The Son is the effect, whose Cause he would deny. And so he seems to be the cause, producing real effects. Nothing can have effects without a cause, and to confuse the two is merely to fail to understand them both. It is as needful that you recognise you made the world you see, as that you recognise that you did not create yourself. They are the same mistake. Nothing created not by your Creator has any influence over you. And if you think what you have made can tell you what you see and feel, and place your faith in its ability to do so, you are denying your Creator and believing that you made yourself. For if you think the world you made has power to make you what it wills, you are confusing Son and Father; effect and Source. The Son’s creations are like his Father’s. Yet in creating them the Son does not delude himself that he is independent of his Source. His union with It is the Source of his creating. Apart from this he has no power to create, and what he makes is meaningless. It changes nothing in creation, depends entirely upon the madness of its maker, and cannot serve to justify the madness. Your brother thinks he made the world with you. Thus he denies creation. With you, he thinks the world he made, made him. Thus he denies he made it. Yet the truth is you and your brother were both created by a loving Father, Who created you together and as one. See what ‘proves’ otherwise, and you deny your whole reality. But grant that everything that seems to stand between you and your brother, keeping you from each other and separate from your Father, you made in secret, and the instant of release has come to you. All its effects are gone, because its source has been uncovered. It is its seeming independence of its source that keeps you prisoner. This is the same mistake as thinking you are independent of the Source by Which you were created, and have never left. Our next few lessons make a special point of firming up your willingness to make your weak commitment strong; your scattered goals blend into one intent. You are not asked for total dedication all the time as yet. But you are asked to practice now in order to attain the sense of peace such unified commitment will bestow, if only intermittently. It is experiencing this that makes it sure that you will give your total willingness to following the way the course sets forth. Our lessons now are geared specifically to widening horizons, and direct approaches to the special blocks that keep your vision narrow, and too limited to let you see the value of our goal. We are attempting now to lift these blocks, however briefly. Words alone can not convey the sense of liberation which their lifting brings. But the experience of freedom and of peace that comes as you give up your tight control of what you see speaks for itself. Your motivation will be so intensified that words become of little consequence. You will be sure of what you want, and what is valueless. And so we start our journey beyond words by concentrating first on what impedes your progress still. Experience of what exists beyond defensiveness remains beyond achievement while it is denied. It may be there, but you cannot accept its presence. So we now attempt to go past all defenses for a little while each day. No more than this is asked, because no more than this is needed. It will be enough to guarantee the rest will come. I trust my brothers, who are one with me. Trusting your brothers is essential to establishing and holding up your faith in your ability to transcend doubt and lack of sure conviction in yourself. When you attack a brother, you proclaim that he is limited by what you have perceived in him. You do not look beyond his errors. Rather, they are magnified, becoming blocks to your awareness of the Self that lies beyond your own mistakes, and past his seeming sins as well as yours. Perception has a focus. It is this that gives consistency to what you see. Change but this focus, and what you behold will change accordingly. Your vision now will shift, to give support to the intent which has replaced the one you held before. Remove your focus on your brother’s sins, and you experience the peace that comes from faith in sinlessness. This faith receives its only sure support from what you see in others past their sins. For their mistakes, if focused on, are witnesses to sins in you. And you will not transcend their sight and see the sinlessness that lies beyond. Therefore, in practicing today, we first let all such little focuses give way to our great need to let our sinlessness become apparent. We instruct our minds that it is this we seek, and only this, for just a little while. We do not care about our future goals. And what we saw an instant previous has no concern for us within this interval of time wherein we practice changing our intent. We seek for innocence and nothing else. We seek for it with no concern but now. A major hazard to success has been involvement with your past and future goals. You have been quite preoccupied with how extremely different the goals this course is advocating are from those you held before. And you have also been dismayed by the depressing and restricting thought that, even if you should succeed, you will inevitably lose your way again. How could this matter? For the past is gone; the future but imagined. These concerns are but defenses against present change of focus in perception. Nothing more. We lay these pointless limitations by a little while. We do not look to past beliefs, and what we will believe will not intrude upon us now. We enter in the time of practicing with one intent; to look upon the sinlessness within. It is not this that I would look upon. And we will also use this thought to keep us safe throughout the day. We do not seek for long-range goals. As each obstruction seems to block the vision of our sinlessness, we seek but for surcease an instant from the misery the focus upon sin will bring, and uncorrected will remain. Nor do we ask for fantasies. For what we seek to look upon is really there. And as our focus goes beyond mistakes, we will behold a wholly sinless world. When seeing this is all we want to see, when this is all we seek for in the name of true perception, are the eyes of Christ inevitably ours. And the Love He feels for us becomes our own as well. This will become the only thing we see reflected in the world and in ourselves. The world which once proclaimed our sins becomes the proof that we are sinless. And our love for everyone we look upon attests to our remembrance of the holy Self which knows no sin, and never could conceive of anything without Its sinlessness. We seek for this remembrance as we turn our minds to practicing today. We look neither ahead nor backwards. We look straight into the present. And we give our trust to the experience we ask for now. Our sinlessness is but the Will of God. This instant is our willing one with His. upon the goal I would achieve. I ask for, and receive as I have asked. This is obviously not a new idea and many people have heard it but few if any have been able to realize it or make it work in their lives. Is there something these people as well as myself have been doing wrong? A: Peace — and the release from all guilt — is the end result of studying the Course and applying its principles (M.28.3:4,5). Although an initial reading of many of the passages of the Course, including the one you quote, would appear to suggest that the Course’s purpose is to show us how to make our lives become what we want them to be, as you study the Course over time, it will become apparent that this is not its intention. In the above passage, the Course is speaking about the choice of feelings and experience only at the level of content, not form: will our experience be one of love or fear, peace or conflict, happiness or pain? There are many passages that make this clear. Among the early workbook lessons are two that admonish us: “I do not perceive my own best interests” (W.pI.24) and “I do not know what anything is for” (W.pI.25). The Course is asking us to acknowledge that we are not in a position to make decisions about what will bring us happiness or joy or peace. That is up to our Guide, the Holy Spirit. “He does know all the facts; past, present and to come. He does know all the effects of His judgment on everyone and everything involved in any way” (M.10.4:8,9). And so, “Ask and He will answer. The responsibility is His, and He alone is fit to assume it. To do so is His function. To refer the questions to Him is yours. Would you want to be responsible for decisions about which you understand so little? Be glad you have a Teacher Who cannot make a mistake. His answers are always right. Would you say that of yours?” (M.29.2:7,8,9,10,11,12,13,14). Even these line are open to misunderstanding and misinterpretation, for it is easy to conclude that they mean that the Holy Spirit will provide all that we need in our world to experience happiness here as we define it, which usually means having our needs met. But again, this is not the intent of the Course. Its focus is to bring about a change at the level of mind, so that we will become increasingly less affected by the things that happen or don’t happen around us and to us. A sen­tence in the text makes this clear: “Seek not to change the world, but choose to change your mind about the world” (T.21.in.1:7). The kind of change that the Course is attempting to bring about within each of us is a shift from judgment to forgiveness. For, as the Course reminds us, “those who have been forgiven have everything” T.3.V.6:3), not in a material sense, but in the sense that we remember that lack and loss of the love that is our natural inheritance is impossible. And we will look out on the world and see only peace, no matter what battles seem to be raging. A Course in Miracles states that “ everything that seems to happen to me I ask for, and receive as I have asked ” (T.21.II.2:5). On one of your tapes you said that if I am stuck and feel miserable, it is because I want to be stuck and feel miserable. I am having such a struggle in this life with everything — job, family, where I live. It just does not seem possible that this is happening because I want to struggle and be unhappy. I feel like I do not want life to be so difficult, and that the way my life has gone and is going is totally out of my control. I know I don’t know what I’m doing or how to be free of all of this misery. When we become aware that we are getting what we ask for, which for some of us is an unhappy life, how do we change it? Or is it just your lot in life? A: First, Jesus is not referring to external circumstances or events in the passage you quoted; he is talking only about our interpretation or how we experience what goes on in our lives. What that means is that seeing yourself as an innocent victim of outside forces is an interpretation. It comes as quite a shock to most students, when, in the very next sentence, he says that to feel that way is self-deception (T.21.II.2:6). It is true that we cannot control most things in the world: the weather, the speed of light, the job and housing markets, the decisions and actions of dictators, etc., but we definitely can control our responses to these forces as they affect our lives. That is the level of responsibility that Jesus is referring to and training us to focus on, because that is the beginning phase of recovering the power of our minds, which we gave away when we chose separation over union with God. This does not mean, though, that you should not take whatever steps you can to improve your situation in the world. The main point is that the peace of God is within our minds as part of our very being and therefore is not dependent on anything outside us. Nothing can take it away or diminish it, as Jesus expresses in the lesson “My salvation comes from me”: “The seeming cost of accepting today’s idea is this: It means that nothing outside yourself can save you; nothing outside yourself can give you peace. But it also means that nothing outside yourself can hurt you, or disturb your peace or upset you in any way” (W.pI.70.2:1,2; see also W.pI.152). This is indeed hard for us to comprehend, but it is the heart of Jesus’ radical message. If peace is within us at all times and we don’t experience it, there can be but one reason: we ourselves chose against it because the ego’s offering was more appealing to us at the moment. We then deny we did that, and blame our lack of peace on something other than that decision. It is true, as you say, that it makes no sense to think we actually want to be miserable and to be constantly struggling, but all that means is that we are not in touch with our mind’s dynamics and are just deluding ourselves about why we are unhappy. Correcting this confusion is a main objective of the lessons in the workbook — for example, Lesson 5 states, “I am never upset for the reason I think” (W.pI.5). Based on the strategy of the ego, what we want (in our wrong minds) is to keep our existence as individuals separate from God, but not the guilt over that; however, to achieve that goal, we cannot stay in our minds, because that’s where God can get us, the ego warns. Therefore, we must project ourselves into another state; and (to abbreviate a very long story) that’s why we experience ourselves only as bodies struggling to survive in a world that seems to throw one problem after another at us. Then the world is the problem, not the decision we are making in our minds, because we are no longer aware that we even have a mind. The ego’s strategy thus has succeeded — apparently. So in A Course in Miracles, Jesus exposes this whole plot and teaches us how to end our suffering through the practice of forgiveness. Similar concerns have been expressed by other students, and you might find it helpful to read these discussions. See Questions #980, #1353, and #1359. Q #322: One section in Chapter 21 of the text of A Course in Miracles which has particular meaning to me is “The Responsibility for Sight.” It illustrates the discomfort that comes from realizing that decisions which appear to be made by me are actually being made on another level, a level I am completely unaware of as the decision-maker. “I” and the decisions “I” appear to make are merely the effects in form of decisions for guilt or innocence made on another level. The statement, “It is as needful that you recognize you made the world you see, as that you recognize that you did not create yourself. They are the same mistake,” touches on this issue, and I would appreciate any comments or elaborations on its meaning. A: In particular, these two sentences are telling us that we need to accept that we, as the split mind, are cause and not effect within the ego thought system, so that we can let go of the world as a defense against our true Identity and recognize that, in reality, within Heaven, we are Effect and not Cause. We see here, as clearly as anywhere, the insanity of the ego thought system. The separation has seemed to come about because we have resented being the created and not the Creator — Effect and not Cause, Son and not Father. And so we seek to make a new, separate identity for ourselves on God’s slain corpse — clearly here we are into a delusional thought system that believes separation from our Source is possible and murder and death are real. Delusions are unstable (T.19.4.A.8:4) and need constant protection in order to be maintained, and so, in cahoots with the ego, we concoct a wild tale of vengeance and defense, and make a world to hide in, as well as a further false identity — a physical self with its own distinct personality — to hide behind. We forget completely that we are the mind that has dreamed this insane hallucination and instead believe that we are at its mercy — effect rather than cause. Hence, the insanity of it all, because we had set out to be our own cause and have convinced ourselves that we have pulled it off. But then we relinquish awareness of that “power” and accept instead a view of ourselves as effects of the world we made, in order to protect our individuality and to cover over the real source of the pain of separation — our own choice to see ourselves as apart from Love. We see the world as the cause of all of our pain so that we never get to the source in our own mind — of both the world and the pain — where we could make a different choice about ourselves and the guilt we believe is so real. As the statement you cite points out, denying that we are the cause and not the effect of the world is nothing more than a cover over our desire to make a world of our own outside of Heaven and deny our true Identity as God’s creation, Christ — each is just a different aspect of the same mistake. But, as your question emphasizes, the shift in perspective back to the mind is not easily made, for our identities are well-entrenched in the world and we have sought to see ourselves as mindless effects or victims of that world. And so Jesus leads us out of our self-imposed prison by inviting us to take small, gentle steps along the path of forgiveness, where we learn to see our interests and our goals as shared with all our brothers rather than as separate. Those little steps will gradually undo the fear and the guilt in our minds so that we will be able first to recognize the “power” of our mind to dream of a world that seems powerful and real while we remain in the dream, and then to recognize that, since it is only a dream and we are the dreamer, we have been the cause of nothing real. And so we have remained forever the loving Effects of a Father Who has never changed His Mind about His Love for us. For more on the decision-making power of the mind, you may wish to look at Question #226. (169) By grace I live. By grace I am released. (170) There is no cruelty in God and none in me. Q #1258: I am continually confronted by my lack of faith in Jesus, God/Higher Power to actually create change in my mind. I want desperately to believe that I can have joy and peace while living in this world, in this lifetime, but it continually eludes me. And then I fear that my lack of faith is what is creating my lack of well-being (e.g., physical, financial) in many areas of my life. The lack of “evidence” of well-being in my experience makes sustained faith impossible for me. It appears that the small willingness necessary for a change in perception is not really enough to create the miracle for me. I spend so much time in observation of my thoughts and in recognition of my misperceptions. I give those mistakes to Jesus, and nothing changes in my experience or in my mind. Could it be that the Course was not meant to be applicable to everyone? A: There are very few students who have not held out some hope that their diligent work with A Course in Miracles would somehow lead to the betterment of their situation in the world. It is hard not to want physical, financial, and other levels of well being, and the Course never asks us to give that up or feel that it is wrong to pursue it. It is just telling us that we will never rid ourselves of the true cause of our unhappiness and frustration that way, because the real problem lies in our mind’s choice to project guilt instead of looking at it without judgment. We know all too well that however secure we may feel in terms of external conditions, that security is always precarious — our world today makes that abundantly clear. Therefore, Jesus cautions us, “Seek not escape from problems here. The world was made that problems could not be escaped” (T.31.IV.2:5,6). Part of us believes that, and part of us doesn’t. Thus our conflicted state of mind. Our investment in believing the body is our reality amounts to an addiction, and our fear of bodily impoverishment and inadequacy is that of an addict’s fear of being without his fix. Jesus explains to us that the source of this investment is the body’s role in protecting us from the devastation we believe is in our minds because we accuse ourselves of having thrown away our wholeness, in our selfish demand for individual existence. “The ego believes that mind is dangerous, and that to make mindless is to heal” (T.8.IX.6:3). As long as we identify with the ego, we will desperately need the body; and even more important, we will need to be successful in the body so that we will never have to go back to the disturbing chaos in our minds. That is the reason we panic when things are not going well. In view of this, we cannot long sustain the thought that we are as God created us, for that means we are not bodies. But the body, once again, with all its needs and problems, is what protects us from what we fear to face in our minds; so we are caught — wanting to believe what the Course says, yet fearing to go there. Therefore, we find a way to compromise between our devotion to the Course and our devotion to achieving security and stability in the world. This ego strategy then leaves us desolate and despairing when things don’t work out the way we think they should, and then we conclude that our faith is wanting; or the Holy Spirit has turned a deaf ear to our pleas; or our sinfulness is just too great, or we haven’t sacrificed enough, etc. That is exactly where the ego wants us to end up — no longer in touch with the truth about ourselves, the world, Jesus, this course, the Holy Spirit, and God, blaming something or someone for our miserable state. Fear is the problem, not a lack of faith or belief. Therefore, just try to be gentle and patient, as you would with anyone you encounter who is frightened. Accept where you are in your process, and ask Jesus to help you look at the real source of your crisis. It is only our fear that makes the Course seem beyond our capability, because as we well know, fear can distort perception and cause us to grasp for anything that promises immediate relief. This course is simply asking us to accept the truth and deny what is false. Again, our fear causes us to complicate this, because fear impels us to erect defenses against it, and then we get lost in the defenses. In the face of the temptation to believe the Course is beyond you, remember Jesus’ many assurances, one comforting example being: “I would not ask you to do things you cannot do, and it is impossible that I could do things you cannot do. Given this, and given this quite literally, nothing can prevent you from doing exactly what I ask, and everything argues for your doing it. I give you no limits because God lays none upon you” (T.8.IX.8:2,3,4). Damnation is your judgement on yourself, and this you will project upon the world. See it as damned, and all you see is what you did to hurt the Son of God. If you behold disaster and catastrophe, you tried to crucify him. If you see holiness and hope, you joined the Will of God to set him free. There is no choice that lies between these two decisions. And you will see the witness to the choice you made, and learn from this to recognise which one you chose. The world you see but shows you how much joy you have allowed yourself to see in you, and to accept as yours. And, if this is its meaning, then the power to give it joy must lie within you. (167) There is one life, and that I share with God. (168) Your grace is given me. I claim it now. Q #1191: My inclination has been for years to feel that I have enough work to do in personal encounters and relationships, and that I do not have to look for more issues coming from the media. I am convinced that the world will not become a better place, and so, not in resignation, but happily, I turn to the only place to go in seriousness, which is inside, and do the work there. I am asking about this because I remember thinking that the world will change some day because of our inner work, and then we will see happy headlines instead of catastrophic headlines. A: It seems as if you are reflecting the important principle of A Course in Miracles : “Seek not to change the world, but choose to change your mind about the world” (T.21.in.1:7) . It is essential to understand this passage as pertaining only to content, not form. The opening statement of the paragraph in which this quote appears provides its context: “Projection makes perception” (T.21.in.1:1) . This is the thrust of Jesus’ teaching and his training of us. He wants us to learn how to perceive correctly, which means learning to make a connection between our perception and the prior choice we made in our minds to identify with the ego thought system or the Holy Spirit’s thought system. Our interpretation of what our eyes see follows directly from that choice. If we identify with the thought system of forgiveness, we can look on scenes of overwhelming devastation and know that devastation has nothing to do with reality (W.pII.13.1:3) . We will not be indifferent to the suffering of others; we will be at peace as we deal with the situations in our lives and the world because we will know that pain and suffering do not define our reality. We will be in the world but not of it. The origin of the world is a thought of attack (W.pII.3.2:1) , and therefore it is not surprising that headlines constantly scream of disaster and catastrophe. That will continue until the mind of God’s Son no longer is attracted to separation. When we are unwilling to pay the high price of being separate, we will ask for help to change our minds about our purpose for being here, and then the world will take on a different purpose: “It becomes a home in which forgiveness is born, and where it grows and becomes stronger and more all-embracing. Here is it nourished, for here it is needed” (M.14.2:2,3) . When every seemingly separate mind has at last accepted the Atonement, the world will not become a better place with “happy headlines”; “It will merely cease to seem to be” (M.14.2:12) . There will be no need for a world when there no longer is any guilt in our minds that needs to be projected. But we needn’t fear that the world will disappear before we are ready to leave it behind: “Fear not that you will be abruptly lifted up and hurled into reality. Time is kind, and if you use it on behalf of reality, it will keep gentle pace with you in your transition. The urgency is only in dislodging your mind from its fixed position here” (T.16.VI.8:1,2,3) . In the section “I Need Do Nothing,” Jesus teaches us how to walk his unique path of forgiveness, a path that has us quietly peaceful in our minds while busily active in the world. It is not a path of indifference or escapism. One way of describing this approach is to say that we learn to become passive to the ego but not to the Holy Spirit. Our peace is sustained by our choice to identify with the Holy Spirit’s thought system, because then whatever we do will be done through us, with no effort or strain on our part. That is the essence of Jesus’ message in this section: “To do nothing is to rest, and make a place within you where the activity of the body ceases to demand attention. . . . This quiet center, in which you do nothing, will remain with you, giving you rest in the midst of every busy doing on which you are sent. For from this center will you be directed how to use the body sinlessly. It is this center, from which the body is absent, that will keep it so in your awareness of it” (T.18.VII.7:7; 8:3,4,5). Vision will come to you at first in glimpses, but they will be enough to show you what is given you who see your brother sinless. Truth is restored to you through your desire, as it was lost to you through your desire for something else. Open the holy place that you closed off by valuing the ‘something else’, and what was never lost will quietly return. It has been saved for you. Vision would not be necessary had judgement not been made. Desire now its whole undoing, and it is done for you. Do you not want to know your own Identity? Would you not happily exchange your doubts for certainty? Would you not willingly be free of misery, and learn again of joy? Your holy relationship offers all this to you. As it was given you, so will be its effects. And as its holy purpose was not made by you, the means by which its happy end is yours is also not of you. Rejoice in what is yours but for the asking, and think not that you need make either means or end. All this is given you who would but see your brother sinless. All this is given, waiting on your desire but to receive it. Vision is freely given to those who ask to see. Your brother’s sinlessness is given you in shining light, to look on with the Holy Spirit’s vision and to rejoice in along with Him. For peace will come to all who ask for it with real desire and sincerity of purpose, shared with the Holy Spirit and at one with Him on what salvation is. Be willing, then, to see your brother sinless, that Christ may rise before your vision and give you joy. And place no value on your brother’s body, which holds him to illusions of what he is. It is his desire to see his sinlessness, as it is yours. And bless the Son of God in your relationship, nor see in him what you have made of him. The Holy Spirit guarantees that what God willed and gave you shall be yours. This is your purpose now, and the vision that makes it yours is ready to be given. You have the vision that enables you to see the body not. And as you look upon your brother, you will see an altar to your Father, holy as Heaven, glowing with radiant purity and sparkling with the shining lilies you laid upon it. What can you value more than this? Why do you think the body is a better home, a safer shelter for God’s Son? Why would you rather look on it than on the truth? How can the engine of destruction be preferred, and chosen to replace the holy home the Holy Spirit offers, where He will dwell with you? The body is the sign of weakness, vulnerability and loss of power. Can such a saviour help you? Would you turn in your distress and need for help unto the helpless? Is the pitifully little the perfect choice to call upon for strength? Judgement will seem to make your saviour weak. Yet it is you who need his strength. There is no problem, no event or situation, no perplexity that vision will not solve. All is redeemed when looked upon with vision. For this is not your sight, and brings with it the laws beloved of Him Whose sight it is. Everything looked upon with vision falls gently into place, according to the laws brought to it by His calm and certain sight. The end for everything He looks upon is always sure. For it will meet His purpose, seen in unadjusted form and suited perfectly to meet it. Destructiveness becomes benign, and sin is turned to blessing under His gentle gaze. What can the body’s eyes perceive, with power to correct? Its eyes adjust to sin, unable to overlook it in any form and seeing it everywhere, in everything. Look through its eyes, and everything will stand condemned before you. All that could save you, you will never see. Your holy relationship, the source of your salvation, will be deprived of meaning, and its most holy purpose bereft of means for its accomplishment. Judgement is but a toy, a whim, the senseless means to play the idle game of death in your imagination. But vision sets all things right, bringing them gently within the kindly sway of Heaven’s laws. What if you recognised this world is an hallucination? What if you really understood you made it up? What if you realised that those who seem to walk about in it, to sin and die, attack and murder and destroy themselves, are wholly unreal? Could you have faith in what you see, if you accepted this? And would you see it? Hallucinations disappear when they are recognised for what they are. This is the healing and the remedy. Believe them not and they are gone. And all you need to do is recognise that you did this. Once you accept this simple fact and take unto yourself the power you gave them, you are released from them. One thing is sure; hallucinations serve a purpose, and when that purpose is no longer held they disappear. Therefore, the question never is whether you want them, but always, do you want the purpose that they serve? This world seems to hold out many purposes, each different and with different values. Yet they are all the same. Again there is no order; only a seeming hierarchy of values. Only two purposes are possible. And one is sin, the other holiness. Nothing is in between, and which you choose determines what you see. For what you see is merely how you elect to meet your goal. Hallucinations serve to meet the goal of madness. They are the means by which the outside world, projected from within, adjusts to sin and seems to witness to its reality. It still is true that nothing is without. Yet upon nothing are all projections made. For it is the projection that gives the ‘nothing’ all the meaning that it holds. What has no meaning cannot be perceived. And meaning always looks within to find itself, and then looks out. All meaning that you give the world outside must thus reflect the sight you saw within; or better, if you saw at all or merely judged against. Vision is the means by which the Holy Spirit translates your nightmares into happy dreams; your wild hallucinations that show you all the fearful outcomes of imagined sin into the calm and reassuring sights with which He would replace them. These gentle sights and sounds are looked on happily, and heard with joy. They are His substitutes for all the terrifying sights and screaming sounds the ego’s purpose brought to your horrified awareness. They step away from sin, reminding you that it is not reality which frightens you, and that the errors which you made can be corrected. When you have looked on what seemed terrifying, and seen it change to sights of loveliness and peace; when you have looked on scenes of violence and death, and watched them change to quiet views of gardens under open skies, with clear, life-giving water running happily beside them in dancing brooks that never waste away; who need persuade you to accept the gift of vision? And after vision, who is there who could refuse what must come after? Think but an instant just on this; you can behold the holiness God gave His Son. And never need you think that there is something else for you to see. (165) Let not my mind deny the Thought of God. (166) I am entrusted with the gifts of God. Q #126: Did Jesus heal by simply seeing the “Christ” in another? A: Since you use the past tense “did” in your question, we should first clarify that the teachings of A Course in Miracles on healing are not based on, nor related to, the Gospel accounts of healing by the historical Jesus. This is an important clarification, because the Course interpretation of “healing,” “Christ,” and “Jesus” differs from the traditional Christian interpretation. With that in mind, we begin by recalling that the Course tells us healing is always of the mind: “Since only the mind can be sick, only the mind can be healed. Only the mind is in need of healing” (P.in.1:2,3). Therefore, no one, including Jesus, actually heals another: “Healing does not come from anyone else. You must accept guidance from within”(T.8.IV.4:5,6). By the same token, anyone whose mind is healed, including Jesus, serves as a reminder to someone who perceives himself as unhealed; that he too can make the choice for healing by accepting the truth about himself. A “healed healer,” one of whom is Jesus, thus serves as a reflection of the truth for anyone who is truly willing to be healed. This may be what you refer to as “seeing the Christ in another.” It means looking without judgment, without difference, and seeing the other as sinless. This is what heals the mind. Accepting the truth about ourselves, which is healing, inherently means accepting ourselves as joined with the entire Sonship. Thus when we accept healing for ourselves, we accept it for the entire Sonship. This is what the Course means when it tells us we are not healed alone — the truth of who we are is the same truth for everyone, and includes everyone. “That is why it makes no difference to what part or by what part of the Sonship the healing is offered. Every part benefits, and benefits equally” (T.5.in.2:6,7). We are not separate individuals seeking individual healing. There is no “individual” to be healed. Therefore, when Jesus accepted the Atonement for himself we were all with him, and were healed along with him. Only our acceptance is required for us to bring this healing to our awareness. Since all sickness is separation, all healing is joining: “Healing is the effect of minds that join, as sickness comes from minds that separate” (T.28.III.2:6). We are healed when we choose to join with Jesus in accepting our healing. This is how the Course tells us healing is accomplished. We have said much about discrepancies of means and end, and how these must be brought in line before your holy relationship can bring you only joy. But we have also said the means to meet the Holy Spirit’s goal will come from the same Source as does His purpose. Being so simple and direct, this course has nothing in it that is not consistent. The seeming inconsistencies, or parts you find more difficult than others, are merely indications of areas where means and end are still discrepant. And this produces great discomfort. This need not be. This course requires almost nothing of you. It is impossible to imagine one that asks so little, or could offer more. The period of discomfort that follows the sudden change in a relationship from sin to holiness may now be almost over. To the extent you still experience it, you are refusing to leave the means to Him Who changed the purpose. You recognise you want the goal. Are you not also willing to accept the means? If you are not, let us admit that you are inconsistent. A purpose is attained by means, and if you want a purpose you must be willing to want the means as well. How can one be sincere and say, ‘I want this above all else, and yet I do not want to learn the means to get it’? To obtain the goal the Holy Spirit indeed asks little. He asks no more to give the means as well. The means are second to the goal. And when you hesitate, it is because the purpose frightens you, and not the means. Remember this, for otherwise you will make the error of believing the means are difficult. Yet how can they be difficult if they are merely given you? They guarantee the goal, and they are perfectly in line with it. Before we look at them a little closer, remember that if you think they are impossible, your wanting of the purpose has been shaken. For if a goal is possible to reach, the means to do so must be possible as well. It is impossible to see your brother as sinless and yet to look upon him as a body. Is this not perfectly consistent with the goal of holiness? For holiness is merely the result of letting the effects of sin be lifted, so what was always true is recognised. To see a sinless body is impossible, for holiness is positive and the body is merely neutral. 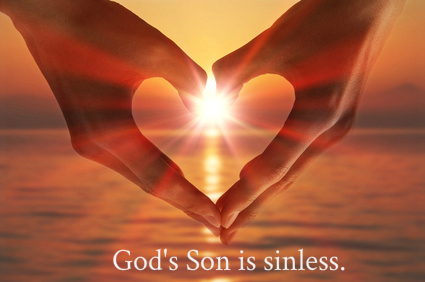 It is not sinful, but neither is it sinless. As nothing, which it is, the body cannot meaningfully be invested with attributes of Christ or of the ego. Either must be an error, for both would place the attributes where they cannot be. And both must be undone for purposes of truth. The body is the means by which the ego tries to make the unholy relationship seem real. The unholy instant is the time of bodies. But the purpose here is sin. It cannot be attained but in illusion, and so the illusion of a brother as a body is quite in keeping with the purpose of unholiness. Because of this consistency, the means remain unquestioned while the end is cherished. Seeing adapts to wish, for sight is always secondary to desire. And if you see the body, you have chosen judgement and not vision. For vision, like relationships, has no order. You either see or not. Who sees a brother’s body has laid a judgement on him, and sees him not. He does not really see him as sinful; he does not see him at all. In the darkness of sin he is invisible. He can but be imagined in the darkness, and it is here that the illusions you hold about him are not held up to his reality. Here are illusions and reality kept separated. Here are illusions never brought to truth, and always hidden from it. And here, in darkness, is your brother’s reality imagined as a body, in unholy relationships with other bodies, serving the cause of sin an instant before he dies. There is indeed a difference between this vain imagining and vision. The difference lies not in them, but in their purpose. Both are but means, each one appropriate to the end for which it is employed. Neither can serve the purpose of the other, for each one is a choice of purpose, employed on its behalf. Either is meaningless without the end for which it was intended, nor is it valued as a separate thing apart from the intention. The means seem real because the goal is valued. And judgement has no value unless the goal is sin. The body cannot be looked upon except through judgement. To see the body is the sign that you lack vision, and have denied the means the Holy Spirit offers you to serve His purpose. How can a holy relationship achieve its purpose through the means of sin? Judgement you taught yourself; vision is learned from Him Who would undo your teaching. His vision cannot see the body because it cannot look on sin. And thus it leads you to reality. Your holy brother, sight of whom is your release, is no illusion. Attempt to see him not in darkness, for your imaginings about him will seem real there. You closed your eyes to shut him out. Such was your purpose, and while this purpose seems to have a meaning, the means for its attainment will be evaluated as worth the seeing, and so you will not see. Your question should not be, ‘How can I see my brother without the body?’ Ask only, ‘Do I really wish to see him sinless?’ And as you ask, forget not that his sinlessness is your escape from fear. Salvation is the Holy Spirit’s goal. The means is vision. For what the seeing look upon is sinless. No one who loves can judge, and what he sees is free of condemnation. And what he sees he did not make, for it was given him to see, as was the vision that made his seeing possible. (163) There is no death. The Son of God is free. (164) Now are we one with Him Who is our Source. Q #953: My husband and I run a small business. Lately we’ve had a rash of experiences in which suppliers send us damaged goods, or behave in slightly hostile ways. I understand that these experiences are symbolic of my fear of God, resulting in guilt and a belief in punishment. What is new is that I feel as though I can’t bear to argue with any of this — to be angry with the suppliers, to worry about the money, or to do anything about it at all! It’s as though I just can’t do it any more. “In my defenselessness my safety lies” has become my motto. I just can’t bear to defend myself in most situations. It hurts too much. And yet there’s the (ego?) fear that I am using the Course to avoid confrontation, or misinterpreting the guidance I seek but am never sure I’m hearing correctly. I feel as though in this life I’ve overcharged, or delivered defective goods in any number of ways. Why should I defend myself against, or be angry about, such treatment from others when I want to forgive them. I’d prefer to just ignore it and let it happen. I just want to let it go and forgive everyone, even if it costs me money or causes me inconvenience. This seems a small price to pay for peace of mind. Am I deluding myself? A: Because A Course in Miracles is a guide to changing your mind not your behavior, there is no right or wrong way to handle things as a Course student. However, it may be helpful to clarify what Jesus means by defenselessness . The Course’s concept of defenselessness has nothing to do with behavior. It is strictly about what happens in the mind. When we choose the ego as our internal teacher, we begin with the premise that we are guilty for having stolen our very existence from God. Then we repress that thought and project it onto others, convincing ourselves that they stole the peace of God from us. On the level of form, we reflect these dynamics whenever we get upset with another person. Whether we are annoyed that they cut us off on the freeway, or furious that they stole our money, underneath our upset is the accusation that they stole the peace of God. On the other hand, when we choose the Holy Spirit as our internal Teacher, no matter what we experience in the world, we know that God’s Love is still in our mind. And since it is there, all the things of which we accuse ourselves clearly have had no effect, and therefore must be made up. That means we are innocent, and if we are, so must everyone else be. With that awareness, it is impossible to do anything but extend love. This then is Jesus’ definition of defenselessness: when we feel no need to defend because nothing has the power to take away our peace . Obviously, very few of us can claim to have achieved that state (and the last thing we should do is pretend that we have). Indeed, the purpose of the Course is to give us a roadmap for getting there. It sends us on an inner journey, which consists of turning every experience in our lives into a classroom in forgiveness. Unfortunately, because of our conditioning to decide everything based on form rather than content, many students inadvertently get off course (pun intended) by assuming that forgiveness means — as you stated — ignoring everything and letting it happen. 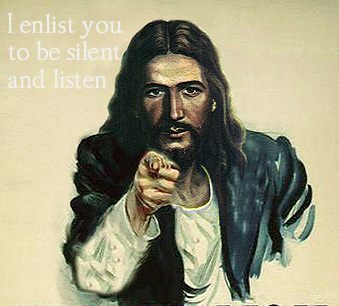 Jesus is not asking us to do that. In fact, letting events in which we appear to be victimized simply happen, as we try to forgive the perpetrator, often leads us right into a vicious ego trap. Not only do our feelings of victimization remain in place (and certain to be projected elsewhere), but we also get to feel superior to those who appear to have wronged us. For example, you said that you want to forgive even if it costs you money and causes you inconvenience . That might be okay, but be sure that you are not implying a causal relationship that does not exist. Do not think that letting another take something from you — in other words, sacrificing something — is a necessary part of your experiencing forgiveness. In reality, there is no link between sacrifice and forgiveness. Nor do you deserve to be mistreated now because you overcharged or delivered defective goods in the past. Like sacrifice, suffering and payback play no part in forgiveness. It is the ego that loves these setups because they mean that you get to be a hero in your own mind (and perhaps the eyes of the world) while the other person remains a villain. Furthermore, you maintain your belief in separate interests. The other person has done something apparently dishonest or unkind and you have decided that it is in your best interest to simply accept it and in his or her best interest not to look at it at all. This could very well be denying both of you your classrooms. The chances are good that you would get the greatest healing from doing what so called normal people do, but giving it a different purpose. In other words, take the appropriate action to prevent others from taking advantage of you, but do so without hating or mentally attacking them. That, of course, requires that before you do anything, you ask the Holy Spirit to look with you at the guilt, fear, and anger that are still in your mind. This will always lead you to discover the course of action that would best serve the interest you share with your brother — awakening from this dream. And then you will feel a true sense of peace that makes it clear you have not deluded yourself. The meaning of the Son of God lies solely in his relationship with his Creator. If it were elsewhere it would rest on contingency, but there is nothing else. And this is wholly loving and forever. Yet has the Son of God invented an unholy relationship between him and his Father. His real relationship is one of perfect union and unbroken continuity. The one he made is partial, self-centred, broken into fragments and full of fear. The one created by his Father is wholly self-encompassing and self-extending. The one he made is wholly self-destructive and self-limiting. Nothing can show the contrast better than the experience of both a holy and an unholy relationship. The first is based on love, and rests on it serene and undisturbed. The body does not intrude upon it. Any relationship in which the body enters is based not on love, but on idolatry. 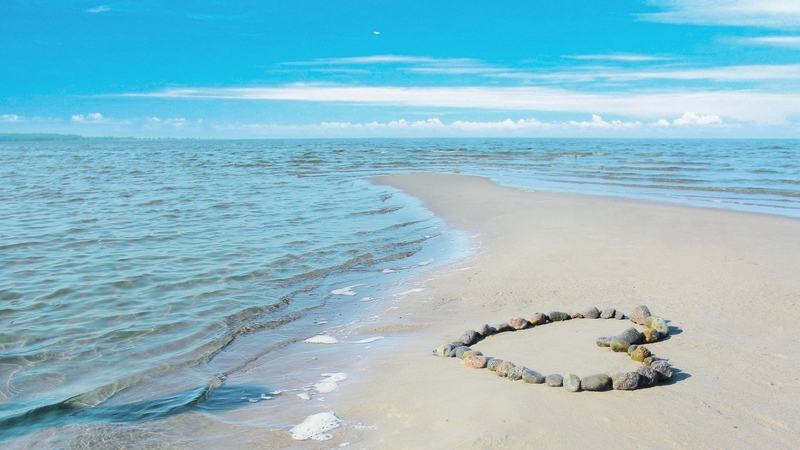 Love wishes to be known, completely understood and shared. It has no secrets; nothing that it would keep apart and hide. It walks in sunlight, open-eyed and calm, in smiling welcome and in sincerity so simple and so obvious it cannot be misunderstood. But idols do not share. Idols accept, but never make return. They can be loved, but cannot love. They do not understand what they are offered, and any relationship in which they enter has lost its meaning. The love of them has made love meaningless. They live in secrecy, hating the sunlight and happy in the body’s darkness, where they can hide and keep their secrets hidden along with them. And they have no relationships, for no one else is welcome there. They smile on no one, and those who smile on them they do not see. Love has no darkened temples where mysteries are kept obscure and hidden from the sun. It does not seek for power, but for relationships. The body is the ego’s chosen weapon for seeking power through relationships. And its relationships must be unholy, for what they are it does not even see. It wants them solely for the offerings on which its idols thrive. The rest it merely throws away, for all that it could offer is seen as valueless. Homeless, the ego seeks as many bodies as it can collect to place its idols in, and so establish them as temples to itself. The Holy Spirit’s temple is not a body, but a relationship. The body is an isolated speck of darkness; a hidden secret room, a tiny spot of senseless mystery, a meaningless enclosure carefully protected, yet hiding nothing. Here the unholy relationship escapes reality, and seeks for crumbs to keep itself alive. Here it would drag its brothers, holding them here in its idolatry. Here it is ‘safe’, for here love cannot enter. The Holy Spirit does not build His temples where love can never be. Would He Who sees the face of Christ choose as His home the only place in all the universe where it can not be seen? You cannot make the body the Holy Spirit’s temple, and it will never be the seat of love. It is the home of the idolater, and of love’s condemnation. For here is love made fearful and hope abandoned. Even the idols that are worshipped here are shrouded in mystery, and kept apart from those who worship them. This is the temple dedicated to no relationships and no return. Here is the ‘mystery’ of separation perceived in awe and held in reverence. What God would have not be is here kept ‘safe’ from Him. But what you do not realise is what you fear within your brother, and would not see in him, is what makes God seem fearful to you, and kept unknown. Idolaters will always be afraid of love, for nothing so severely threatens them as love’s approach. Let love draw near them and overlook the body, as it will surely do, and they retreat in fear, feeling the seeming firm foundation of their temple begin to shake and loosen. Brother, you tremble with them. Yet what you fear is but the herald of escape. This place of darkness is not your home. Your temple is not threatened. You are an idolater no longer. The Holy Spirit’s purpose lies safe in your relationship, and not your body. You have escaped the body. Where you are the body cannot enter, for the Holy Spirit has set His temple there. There is no order in relationships. They either are or not. An unholy relationship is no relationship. It is a state of isolation, which seems to be what it is not. No more than that. The instant that the mad idea of making your relationship with God unholy seemed to be possible, all your relationships were made meaningless. In that unholy instant time was born, and bodies made to house the mad idea and give it the illusion of reality. And so it seemed to have a home that held together for a little while in time, and vanished. For what could house this mad idea against reality but for an instant? Idols must disappear, and leave no trace behind their going. The unholy instant of their seeming power is frail as is a snowflake, but without its loveliness. Is this the substitute you want for the eternal blessing of the holy instant and its unlimited beneficence? Is the malevolence of the unholy relationship, so seeming powerful and so bitterly misunderstood and so invested in a false attraction your preference to the holy instant, which offers you peace and understanding? Then lay aside the body and quietly transcend it, rising to welcome what you really want. And from His holy temple, look you not back on what you have awakened from. For no illusions can attract the mind that has transcended them, and left them far behind. The holy relationship reflects the true relationship the Son of God has with his Father in reality. The Holy Spirit rests within it in the certainty it will endure forever. Its firm foundation is eternally upheld by truth, and love shines on it with the gentle smile and tender blessing it offers to its own. Here the unholy instant is exchanged in gladness for the holy one of safe return. Here is the way to true relationships held gently open, through which you and your brother walk together, leaving the body thankfully behind and resting in the Everlasting Arms. Love’s arms are open to receive you, and give you peace forever. The body is the ego’s idol; the belief in sin made flesh and then projected outward. This produces what seems to be a wall of flesh around the mind, keeping it prisoner in a tiny spot of space and time, beholden unto death, and given but an instant in which to sigh and grieve and die in honour of its master. And this unholy instant seems to be life; an instant of despair, a tiny island of dry sand, bereft of water and set uncertainly upon oblivion. Here does the Son of God stop briefly by, to offer his devotion to death’s idols and then pass on. And here he is more dead than living. Yet it is also here he makes his choice again between idolatry and love. Here it is given him to choose to spend this instant paying tribute to the body, or let himself be given freedom from it. Here he can accept the holy instant, offered him to replace the unholy one he chose before. And here can he learn relationships are his salvation, and not his doom. You who are learning this may still be fearful, but you are not immobilised. The holy instant is of greater value now to you than its unholy seeming counterpart, and you have learned you really want but one. This is no time for sadness. Perhaps confusion, but hardly discouragement. You have a real relationship, and it has meaning. It is as like your real relationship with God as equal things are like unto each other. Idolatry is past and meaningless. Perhaps you fear your brother a little yet; perhaps a shadow of the fear of God remains with you. Yet what is that to those who have been given one true relationship beyond the body? Can they be long held back from looking on the face of Christ? And can they long withhold the memory of their relationship with their Father from themselves, and keep remembrance of His Love apart from their awareness? (161) Give me your blessing, holy Son of God. (162) I am as God created me. Q #1375: We are going all the way. Is this why we Course students do so many crazy shenanigans? Because somewhere in our minds, we know this is it? I’ve heard Ken say that the fear level in Course students is high. Is that why? A: Yes, ultimately our fear is of returning home to God because that means letting go of everything we made to replace our true Identity as Christ, eternally one with God. The sincere and honest practice of A Course in Miracles is a process that gradually exposes the series of lies on which our lives have been based, which means we begin to sense (with varying degrees of discomfort) that we are not who we think we are and our lives and all of our relationships are not what we think they are. Then we realize that no one did this to us — we chose to deceive ourselves to get the separate and special identity that we wanted but could not have as part of God’s perfect Oneness. In our determination to get and maintain this identity we became indifferent to the fact that it would always be at someone else’s expense, starting with God Himself. A truly horrifying recognition. The fear that we would some day get caught and then punished for this is hidden in our minds. And therefore when the once tightly sealed lid that kept this fear concealed begins to loosen, the fear starts to rise to the surface. It was always there, and identifying with individualized bodily existence was supposed to protect us from it, but when we choose to embark on the journey with Jesus, he gently leads us within to uncover the deception that has resulted in the colossal mess we call our world and our lives. Fear is inevitable as we go within, because, once again, the purpose of choosing the body and the world as our home was to prevent us from ever getting in touch with the terror we believed defined our home in the mind. The value of our relationship with Jesus is that he is not part of our insanity — he symbolizes for us the sane part of our mind that we had split off — and therefore he can help us retrace our misguided steps back to the point where we made the one mistake of believing we pulled off the impossible: separating from eternal Oneness. Our fear dissipates as we simply look at it with his vision becoming ours, which reveals its unreality. We sacrifice nothing; we merely let go of what never was. Students’ struggles with fear and their defenses against it are discussed in a series of Questions — see, for example, #384, #533, #943, #963, and #986. In this world, God’s Son comes closest to himself in a holy relationship. There he begins to find the certainty his Father has in him. And there he finds his function of restoring his Father’s laws to what was held outside them, and finding what was lost. Only in time can anything be lost, and never lost forever. So do the parts of God’s Son gradually join in time, and with each joining is the end of time brought nearer. Each miracle of joining is a mighty herald of eternity. No one who has a single purpose, unified and sure, can be afraid. No one who shares his purpose with him can not be one with him. Each herald of eternity sings of the end of sin and fear. Each speaks in time of what is far beyond it. Two voices raised together call to the hearts of everyone, to let them beat as one. And in that single heartbeat is the unity of love proclaimed and given welcome. Peace to your holy relationship, which has the power to hold the unity of the Son of God together. You give to your brother for everyone, and in your gift is everyone made glad. Forget not Who has given you the gifts you give, and through your not forgetting this, will you remember Who gave the gifts to Him to give to you. It is impossible to overestimate your brother’s value. Only the ego does this, but all it means is that it wants the other for itself, and therefore values him too little. What is inestimable clearly cannot be evaluated. Do you recognise the fear that rises from the meaningless attempt to judge what lies so far beyond your judgement you cannot even see it? Judge not what is invisible to you or you will never see it, but wait in patience for its coming. It will be given you to see your brother’s worth when all you want for him is peace. And what you want for him you will receive. How can you estimate the worth of him who offers peace to you? What would you want except his offering? His worth has been established by his Father, and you will recognise it as you receive his Father’s gift through him. What is in him will shine so brightly in your grateful vision that you will merely love him and be glad. You will not think to judge him, for who would see the face of Christ and yet insist that judgement still has meaning? For this insistence is of those who do not see. Vision or judgement is your choice, but never both of these. Your brother’s body is as little use to you as it is to him. When it is used only as the Holy Spirit teaches, it has no function. For minds need not the body to communicate. The sight that sees the body has no use which serves the purpose of a holy relationship. And while you look upon your brother thus, the means and end have not been brought in line. Why should it take so many holy instants to let this be accomplished, when one would do? There is but one. The little breath of eternity that runs through time like golden light is all the same; nothing before it, nothing afterwards. You look upon each holy instant as a different point in time. It never changes. All that it ever held or will ever hold is here right now. The past takes nothing from it, and the future will add no more. Here, then, is everything. Here is the loveliness of your relationship, with means and end in perfect harmony already. Here is the perfect faith that you will one day offer to your brother already offered you; and here the limitless forgiveness you will give him already given, the face of Christ you yet will look upon already seen. Can you evaluate the giver of a gift like this? Would you exchange this gift for any other? This gift returns the laws of God to your remembrance. And merely by remembering them, the laws that held you prisoner to pain and death must be forgotten. This is no gift your brother’s body offers you. The veil that hides the gift hides him as well. He is the gift, and yet he knows it not. No more do you. And yet, have faith that He Who sees the gift in you and your brother will offer and receive it for you both. And through His vision will you see it, and through His understanding recognise it and love it as your own. Be comforted, and feel the Holy Spirit watching over you in love and perfect confidence in what He sees. He knows the Son of God, and shares his Father’s certainty the universe rests in his gentle hands in safety and in peace. Let us consider now what he must learn, to share his Father’s confidence in him. What is he, that the Creator of the universe should offer it to him and know it rests in safety? He looks upon himself not as his Father knows him. And yet it is impossible the confidence of God should be misplaced. Q #203: A group of friends and I are reading A Course in Miracles, and we want to know whether the lessons must be strictly done daily, or if you may stay with some of them for a week or two, until you grasp them deeply? A: The only specifications for the Workbook practice are given in its Introduction. It does not say not to repeat a lesson, it only says: “Do not undertake to do more than one set of exercises a day” (W.in.2:6). It is therefore not out of keeping with the Workbook instructions to repeat a lesson. If it is a particularly meaningful or difficult lesson, it might be a good idea to stay with it for a couple of days. However, there is a risk in thinking that a lesson needs to be done perfectly, or even “grasped deeply” before moving on to the next lesson. This would be a trap, because it is unlikely that many of us will ever do one of the lessons perfectly. If we could, we would have reached such an advanced state of spiritual growth that we would not need the lessons at all. The best thing is to try to do what the lesson asks as best you can, being aware of the resistance that comes up. Resistance is what makes the lesson impossible to remember; it is behind our forgetting the repetitions, and our difficulty in understanding the lesson. It is important to recognize this, as a demonstration of our unwillingness to learn the thought system the Workbook teaches, and of our refusal to allow our minds to be trained “to a different perception of everyone and everything in the world” (W.in.4:1). If we mistakenly believe we can master a lesson in a few days, we are underestimating our attachment to the ego’s thought system, and this will hinder our progress rather than help it. The important thing is to be sincere in our attempts to study and practice what the Workbook teaches, aware that we are full of resistance, and willing to forgive ourselves for our often mediocre efforts. As long as we continue to study and apply the lessons as we are instructed, we will make progress. It may be helpful for your group to occasionally reread the Workbook instructions together. It keeps us on track to go back to the beginning once in a while. Nothing can hurt you unless you give it the power to do so. Yet you give power as the laws of this world interpret giving; as you give you lose. It is not up to you to give power at all. 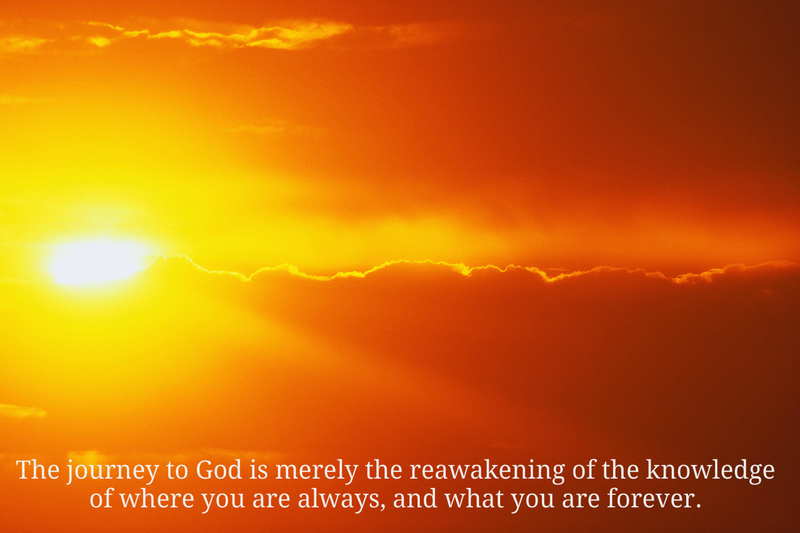 Power is of God, given by Him and reawakened by the Holy Spirit, who knows that as you give you gain. He gives no power to sin, and therefore it has none; nor to its results as this world sees themâ€”sickness and death and misery and pain. These things have not occurred because the Holy Spirit sees them not, and gives no power to their seeming source. Thus would He keep you free of them. Being without illusion of what you are, the Holy Spirit merely gives everything to God, Who has already given and received all that is true. The untrue He has neither received nor given. Sin has no place in Heaven, where its results are alien and can no more enter than can their source. And therein lies your need to see your brother sinless. In him is Heaven. See sin in him instead, and Heaven is lost to you. But see him as he is, and what is yours shines from him to you. Your saviour gives you only love, but what you would receive of him is up to you. It lies in him to overlook all your mistakes, and therein lies his own salvation. And so it is with yours. Salvation is a lesson in giving, as the Holy Spirit interprets it. It is the reawakening of the laws of God in minds that have established other laws, and given them power to enforce what God created not. Your insane laws were made to guarantee that you would make mistakes, and give them power over you by accepting their results as your just due. What could this be but madness? And is it this that you would see within your saviour from insanity? He is as free from this as you are, and in the freedom that you see in him you see your own. For this you share. What God has given follows His laws, and His alone. Nor is it possible for those who follow them to suffer the results of any other source. Those who choose freedom will experience only its results. Their power is of God, and they will give it only to what God has given, to share with them. Nothing but this can touch them, for they see only this, sharing their power according to the Will of God. And thus their freedom is established and maintained. It is upheld through all temptation to imprison and to be imprisoned. It is of them who learned of freedom that you should ask what freedom is. Ask not the sparrow how the eagle soars, for those with little wings have not accepted for themselves the power to share with you. The sinless give as they received. See, then, the power of sinlessness within your brother, and share with him the power of the release from sin you offered him. To each who walks this earth in seeming solitude is a saviour given, whose special function here is to release him, and so to free himself. In the world of separation each is appointed separately, though they are all the same. Yet those who know that they are all the same need not salvation. And each one finds his saviour when he is ready to look upon the face of Christ, and see Him sinless. The plan is not of you, nor need you be concerned with anything except the part that has been given you to learn. For He Who knows the rest will see to it without your help. But think not that He does not need your part to help Him with the rest. For in your part lies all of it, without which is no part complete, nor is the whole completed without your part. The ark of peace is entered two by two, yet the beginning of another world goes with them. Each holy relationship must enter here, to learn its special function in the Holy Spirit’s plan, now that it shares His purpose. And as this purpose is fulfilled, a new world rises in which sin can enter not, and where the Son of God can enter without fear and where he rests a while, to forget imprisonment and to remember freedom. How can he enter, to rest and to remember, without you? Except you be there, he is not complete. And it is his completion that he remembers there. This is the purpose given you. Think not that your forgiveness of your brother serves but you two alone. For the whole new world rests in the hands of every two who enter here to rest. And as they rest, the face of Christ shines on them and they remember the laws of God, forgetting all the rest and yearning only to have His laws perfectly fulfilled in them and all their brothers. Think you when this has been achieved that you will rest without them? You could no more leave one of them outside than I could leave you, and forget part of myself. You may wonder how you can be at peace when, while you are in time, there is so much that must be done before the way to peace is open. Perhaps this seems impossible to you. But ask yourself if it is possible that God would have a plan for your salvation that does not work. Once you accept His plan as the one function that you would fulfil, there will be nothing else the Holy Spirit will not arrange for you without your effort. He will go before you making straight your path, and leaving in your way no stones to trip on, and no obstacles to bar your way. Nothing you need will be denied you. Not one seeming difficulty but will melt away before you reach it. You need take thought for nothing, careless of everything except the only purpose that you would fulfil. As that was given you, so will its fulfilment be. God’s guarantee will hold against all obstacles, for it rests on certainty and not contingency. It rests on you. And what can be more certain than a Son of God? (157) Into His Presence would I enter now. (158) Today I learn to give as I receive. Q #223: I would like an understanding of “Entering the Ark” (T.20.1V). This section seems to indicate that we have one special person with whom we work out our salvation, whereas my understanding is that every seemingly separate individual out there is our brother and so we must see the face of Christ in every living thing. I am in a marriage where my wife does not study A Course in Miracles and, in my perception, is afraid of what it is teaching us. I have also encountered a Course teaching institution that tells us we must have one special buddy with whom we can really study and work out our salvation. Can you resolve this confusion for me? A: You seem to be raising two related questions: the first is whether there is only one relationship or many in which we must practice forgiveness; the second is whether we can really practice the Course and learn our forgiveness lessons if our learning partner is not a student of the Course. For the first, you are no doubt referring in particular to the sentence in “The Ark of Peace” that says, “To each who walks this earth in seeming solitude is a savior given, whose special function here is to release him, and so to free himself” (T.20.IV.5:3). Jesus then adds, “In the world of separation each is appointed separately, though they are all the same” (T.20.IV.5:4). You are correct, as this second sentence suggests, in observing that forgiveness must come to rest upon every seemingly separate brother until we see them as all the same. But it is also usually the case that, at any point in time, there is one particular person with whom we are struggling, who provides our most challenging lessons in forgiveness. Who this other is may or may not change over time. But even though the faces may change, the underlying lessons will remain the same, until we are willing to look at and then release the guilt that we have projected on to them because we have not wanted to acknowledge it is in our own minds. So every relationship provides opportunities to practice forgiveness, but those that seem to push more of our buttons are the greater symbols of our own buried guilt and so provide the maximal opportunities for learning our lessons. Jesus speaks in the manual of these different levels of learning opportunities in the context of teacher-student relationships (M.3). As for your second question, a careful reading of the section you refer to should make it clear that Jesus is only talking about how we perceive our learning partner and not about what specifically happens at the level of behavior or form between the two of us. It is our ego that wants to bring the focus to what we do with our partner at the level of bodies. According to the Course, relationships exist only in the mind and not between bodies in the world (T.28.IV.3). And so my healing in any relationship is completely unrelated to how you as my learning partner may or may not participate in the study and application of Course principles. If I were dependent on your involvement in any way, I would be at the mercy of your choices, and not simply dependent on my own internal decision about how to perceive you. Now in some cases, it may be helpful if a partner is also studying the Course and there are opportunities for sharing and discussing on the level of form. But this can in no way be necessary for my salvation or Jesus would be selling us the same bill of goods that the ego has been trying to pass off on us from the beginning — victimization of myself by another would be alive and well and inescapable. Furthermore, whether you as my learning partner are in your right mind or your wrong mind in any of our interactions, if the Holy Spirit is my Guide for how I perceive you, my response will always be the same. For, accepting the Holy Spirit’s judgment rather than my own, I will know that you are only either extending love or giving a call for love, and my response is always the same — I allow myself to be an instrument of the Holy Spirit’s Love (T.12.I). My resistance to accepting the Holy Spirit’s perception of you in any aspects of our relationship simply points to those areas where my forgiveness lessons remain unlearned. And that is how you, as my learning partner, are really my savior, for you direct me to the unhealed thoughts of darkness in my mind, so that now I can make a different choice about how to see myself. The belief in sin is an adjustment. And an adjustment is a change; a shift in perception, or a belief that what was so before has been made different. Every adjustment is therefore a distortion, and calls upon defences to uphold it against reality. Knowledge requires no adjustments and, in fact, is lost if any shift or change is undertaken. For this reduces it at once to mere perception; a way of looking in which certainty is lost and doubt has entered. To this impaired condition are adjustments necessary, because it is not true. Who need adjust to truth, which calls on only what he is, to understand? Adjustments of any kind are of the ego. For it is the ego’s fixed belief that all relationships depend upon adjustments, to make of them what it would have them be. Direct relationships, in which there are no interference’s, are always seen as dangerous. The ego is the self-appointed mediator of all relationships, making whatever adjustments it deems necessary and interposing them between those who would meet, to keep them separate and prevent their union. It is this studied interference that makes it difficult for you to recognise your holy relationship for what it is. The holy do not interfere with truth. They are not afraid of it, for it is within the truth they recognise their holiness, and rejoice at what they see. They look on it directly, without attempting to adjust themselves to it, or it to them. And so they see that it was in them, not deciding first where they would have it be. Their looking merely asks a question, and it is what they see that answers them. You make the world and then adjust to it, and it to you. Nor is there any difference between yourself and it in your perception, which made them both. A simple question yet remains, and needs an answer. Do you like what you have made?â€”a world of murder and attack, through which you thread your timid way through constant dangers, alone and frightened, hoping at most that death will wait a little longer before it overtakes you and you disappear. You made this up. It is a picture of what you think you are; of how you see yourself. A murderer is frightened, and those who kill fear death. All these are but the fearful thoughts of those who would adjust themselves to a world made fearful by their adjustments. And they look out in sorrow from what is sad within, and see the sadness there. Have you not wondered what the world is really like; how it would look through happy eyes? The world you see is but a judgement on yourself. It is not there at all. Yet judgement lays a sentence on it, justifies it and makes it real. Such is the world you see; a judgement on yourself, and made by you. This sickly picture of yourself is carefully preserved by the ego, whose image it is and which it loves, and placed outside you in the world. And to this world must you adjust as long as you believe this picture is outside, and has you at its mercy. This world is merciless, and were it outside you, you should indeed be fearful. Yet it was you who made it merciless, and now if mercilessness seems to look back at you, it can be corrected. Who in a holy relationship can long remain unholy? The world the holy see is one with them, just as the world the ego looks upon is like itself. The world the holy see is beautiful because they see their innocence in it. They did not tell it what it was; they did not make adjustments to fit their orders. They gently questioned it and whispered, ‘What are you?’ And He Who watches over all perception answered. Take not the judgement of the world as answer to the question, ‘What am I?’ The world believes in sin, but the belief that made it as you see it is not outside you. Does one ask judgement of what is totally bereft of judgement? And if you have, would you believe the answer, and adjust to it as if it were the truth? The world you look on is the answer that it gave you, and you have given it power to adjust the world to make its answer true. You asked this puff of madness for the meaning of your unholy relationship, and adjusted it according to its insane answer. How happy did it make you? Did you meet your brother with joy to bless the Son of God, and give him thanks for all the happiness that he held out to you? Did you recognise your brother as the eternal gift of God to you? Did you see the holiness that shone in both you and your brother, to bless the other? That is the purpose of your holy relationship. Ask not the means of its attainment of the one thing that still would have it be unholy. Give it no power to adjust the means and end. Prisoners bound with heavy chains for years, starved and emaciated, weak and exhausted, and with eyes so long cast down in darkness they remember not the light, do not leap up in joy the instant they are made free. It takes a while for them to understand what freedom is. You groped but feebly in the dust and found your brother’s hand, uncertain whether to let it go or to take hold on life so long forgotten. Strengthen your hold and raise your eyes unto your strong companion, in whom the meaning of your freedom lies. He seemed to be crucified beside you. And yet his holiness remained untouched and perfect, and with him beside you, you shall this day enter with him to Paradise, and know the peace of God. Such is my will for you and your brother, and for each of you for one another and for himself. Here there is only holiness and joining without limit. For what is Heaven but union, direct and perfect, and without the veil of fear upon it? Here are we one, looking with perfect gentleness upon each other and on ourselves. Here all thoughts of any separation between us become impossible. You who were prisoners in separation are now made free in Paradise. And here would I unite with you, my friend, my brother and my Self. Your gift unto your brother has given me the certainty our union will be soon. Share, then, this faith with me, and know that it is justified. There is no fear in perfect love because it knows no sin, and it must look on others as on itself. Looking with charity within, what can it fear without? The innocent see safety, and the pure in heart see God within His Son, and look unto the Son to lead them to the Father. And where else would they go but where they will to be? You and your brother now will lead the other to the Father as surely as God created His Son holy, and kept him so. In your brother is the light of God’s eternal promise of your immortality. See him as sinless, and there can be no fear in you. (155) I will step back and let Him lead the way. (156) I walk with God in perfect holiness. Q #1297 : I was sitting in the library one evening and I noticed a certain book glowing. There was just something about it that made me know I needed to read it. So I took the random book and it turned out to be A Course in Miracles . I’ve spent much time over the last six years not only studying the Course but also other spiritualities, philosophies, and thought systems. I have reached the conclusion that nothing in this universe actually exists except the minds of the people. I absolutely do not believe in matter! I believe if we had mass con­sciousness believing along the same lines, this entire world as we see it would disappear and the Sonship would become reunited. Don’t get me wrong though, I do believe that all works of good that a fellow brother does for another will be remembered for eternity in God’s Mind, but everything else will be erased when full Atonement is achieved. A: A Course in Miracles clearly teaches that the world and the body are illusory, and that the world will disappear into the nothingness from which it came when we no longer want the pur­pose it serves. “When not one thought of sin remains, the world is over. It will not be destroyed nor attacked nor even touched. It will merely cease to seem to be” (M.14.2:10,11,12; see also T.20.VIII.7,8,9,10,11; W.pII.226). The world, thus, is not the prob­lem, as it is nothing but a projection of the mind, “the outside picture of an inward condition” (T.21.in.1:5). The Course therefore teaches us to look within at what is causing us to project out­ward and identify with the form the projection takes. That is the core of its teaching and mind- training exercises. Early in the text Jesus talks about the difficulty of getting through to us: “How can you teach someone the value of something he has deliberately thrown away? He must have thrown it away because he did not value it. You can only show him how miserable he is without it, and slowly bring it nearer so he can learn how his misery lessens as he approaches it. This teaches him to associate his misery with its absence, and the opposite of misery with its pres­ence. It gradually becomes desirable as he changes his mind about its worth. I am teaching you to associate misery with the ego and joy with the spirit. You have taught yourself the opposite. You are still free to choose, but can you really want the rewards of the ego in the presence of the rewards of God?” (T.4.VI.5) The pedagogy of this course is well thought out — it meets us where we are and respects the choices we have made to dissociate ourselves from truth and love, while at the same time it shows us the disastrous consequences of those choices. It is never coercive or threatening, however, just abundantly clear about the mess we have made of everything, including our self-identity, why we have done it, and how to undo it all. Its approach is gentle and encouraging, reassuring us that there is no urgency, as ultimately time is unreal and we are undoing what never happened (the principle of the Atonement). Everything we need to restore to our minds the awareness of love’s presence is already in the Course. For those for whom this course resonates, nothing more is needed. Other paths are available to those who are not com­fortable with this one (M.1.4:1,2). The Course often addresses the concern, to use your words, of how to “live in an illusory world recognizing the absurdness of it all and pay attention to the illusion to some extent; i.e., not get­ting run over by cars, walking naked down the highway, etc.” Lesson 155 teaches us, for example, that “there is a way of living in the world that is not here, although it seems to be. You do not change appearance, though you smile more frequently. Your forehead is serene; your eyes are quiet. And the ones who walk the world as you do recognize their own. Yet those who have not yet perceived the way will recognize you also, and believe that you are like them, as you were before” (W.pI.155.1). There is also a section in the manual for teachers that discusses this aspect of our process: “How Should the Teacher of God Spend His Day?” (M.16). A Course in Miracles surely is not the final word in spirituality, as it is directed to those on the bottom rungs of the spiritual ladder (i.e., all of us); but for those of us who have accepted it as our path home, it is more than sufficient, which is why Jesus says at the end of the 365 lessons of the workbook, “This course is a beginning, not an end” (W.ep.1:1). We spend the rest of our lives applying its teachings to our personal lives. We needn’t try to convince others to change how they go about their lives. Our focus is exclusively on how we choose to perceive others and the world: “Therefore, seek not to change the world, but choose to change your mind about the world” (T.21.in.1:7). Our only responsibility is to accept the Atonement for ourselves (T.2.V.5:1) . If I do that, then I know everyone has done it, because the Sonship is one. As long as I believe that others still have to do it, my mind is not yet healed, because I am still perceiving the Sonship as frag­mented. This is a major difference between the Course’s teaching and your belief that “if we had mass consciousness believing along the same lines, this entire world as we see it would disappear and the Sonship would become reunited.” If this were true, there would be actual parts of the Son­ship, and some would be victims of others because these others still choose to remain separate. That is decidedly different from the entire thrust of Jesus’ teaching in the Course. One further thought about A Course in Miracles and its “evolution”: It is impossible for a brain/ mind as limited as ours to fully understand this course, which comes from a mind that transcends time and space entirely and is without limit. That, again, is why the Course teaches that our only responsibility is to accept the Atonement for ourselves. Finally, there is a lovely passage — seems more like a song Jesus is singing — that blends with your belief that “all works of good that a fellow brother does for another will be remembered for eternity in God’s Mind”; we quote in part: “How can you who are so holy suffer? All your past except its beauty is gone; and nothing is left but a blessing. I have saved all your kindnesses and every loving thought you ever had. I have purified them of the errors that hid their light, and kept them for you in their own perfect radiance. They are beyond destruction and beyond guilt. They come from the Holy Spirit within you, and we know what God creates is eternal” (T.5.IV.8:1,2,3,4,5,6). Look upon all the trinkets made to hang upon the body, or to cover it or for its use. See all the useless things made for its eyes to see. Think on the many offerings made for its pleasure, and remember all these were made to make seem lovely what you hate. Would you employ this hated thing to draw your brother to you, and to attract his body’s eyes? Learn you but offer him a crown of thorns, not recognising it for what it is, and trying to justify your own interpretation of its value by his acceptance. Yet still the gift proclaims his worthlessness to you, as his acceptance and delight acknowledges the lack of value he places on himself. Gifts are not made through bodies, if they be truly given and received. For bodies can neither offer nor accept; hold out nor take. Only the mind can value, and only the mind decides on what it would receive and give. And every gift it offers depends on what it wants. It will adorn its chosen home most carefully, making it ready to receive the gifts it wants by offering them to those who come unto its chosen home, or those it would attract to it. And there they will exchange their gifts, offering and receiving what their minds judge to be worthy of them. Each gift is an evaluation of the receiver and the giver. No one but sees his chosen home as an altar to himself. No one but seeks to draw to it the worshippers of what he placed upon it, making it worthy of their devotion. And each has set a light upon his altar, that they may see what he has placed upon it and take it for their own. Here is the value that you lay upon your brother and on yourself. Here is your gift to both; your judgement on the Son of God for what he is. Forget not that it is your saviour to whom the gift is offered. Offer him thorns and you are crucified. Offer him lilies and it is yourself you free. I have great need for lilies, for the Son of God has not forgiven me. And can I offer him forgiveness when he offers thorns to me? For he who offers thorns to anyone is against me still, and who is whole without him? Be you his friend for me, that I may be forgiven and you may look upon the Son of God as whole. But look you first upon the altar in your chosen home, and see what you have laid upon it to offer me. If it be thorns whose points gleam sharply in a blood-red light, the body is your chosen home and it is separation that you offer me. And yet the thorns are gone. Look you still closer at them now, and you will see your altar is no longer what it was. You look still with the body’s eyes, and they can see but thorns. Yet you have asked for and received another sight. Those who accept the Holy Spirit’s purpose as their own share also His vision. And what enables Him to see His purpose shine forth from every altar now is yours as well as His. He sees no strangers; only dearly loved and loving friends. He sees no thorns but only lilies, gleaming in the gentle glow of peace that shines on everything He looks upon and loves. This Easter, look with different eyes upon your brother. You have forgiven me. And yet I cannot use your gift of lilies while you see them not. Nor can you use what I have given unless you share it. The Holy Spirit’s vision is no idle gift, no plaything to be tossed about a while and laid aside. Listen and hear this carefully, nor think it but a dream, a careless thought to play with, or a toy you would pick up from time to time and then put by. For if you do, so will it be to you. You have the vision now to look past all illusions. It has been given you to see no thorns, no strangers and no obstacles to peace. The fear of God is nothing to you now. Who is afraid to look upon illusions, knowing his saviour stands beside him? With him, your vision has become the greatest power for the undoing of illusion that God Himself could give. For what God gave the Holy Spirit, you have received. The Son of God looks unto you for his release. For you have asked for and been given the strength to look upon this final obstacle, and see no thorns nor nails to crucify the Son of God, and crown him king of death. Your chosen home is on the other side, beyond the veil. It has been carefully prepared for you, and it is ready to receive you now. You will not see it with the body’s eyes. Yet all you need you have. Your home has called to you since time began, nor have you ever failed entirely to hear. You heard, but knew not how to look, nor where. And now you know. In you the knowledge lies, ready to be unveiled and freed from all the terror that kept it hidden. There is no fear in love. The song of Easter is the glad refrain the Son of God was never crucified. Let us lift up our eyes together, not in fear but faith. And there will be no fear in us, for in our vision will be no illusions; only a pathway to the open door of Heaven, the home we share in quietness and where we live in gentleness and peace, as one together. Would you not have your holy brother lead you there? His innocence will light your way, offering you its guiding light and sure protection, and shining from the holy altar within him where you laid the lilies of forgiveness. Let him be to you the saviour from illusions, and look on him with the new vision that looks upon the lilies and brings you joy. We go beyond the veil of fear, lighting each other’s way. The holiness that leads us is within us, as is our home. So will we find what we were meant to find by Him Who leads us. This is the way to Heaven and to the peace of Easter, in which we join in glad awareness that the Son of God is risen from the past, and has awakened to the present. Now is he free, unlimited in his communion with all that is within him. Now are the lilies of his innocence untouched by guilt, and perfectly protected from the cold chill of fear and withering blight of sin alike. Your gift has saved him from the thorns and nails, and his strong arm is free to guide you safely, through them and beyond. Walk with him now rejoicing, for the saviour from illusions has come to greet you, and lead you home with him. Here is your saviour and your friend, released from crucifixion through your vision, and free to lead you now where he would be. He will not leave you, nor forsake the saviour in his pain. And gladly will you and your brother walk the way of innocence together, singing as you behold the open door of Heaven and recognise the home that called to you. Give joyously to your brother the freedom and the strength to lead you there. And come before his holy altar where the strength and freedom wait, to offer and receive the bright awareness that leads you home. The lamp is lit in you for your brother. And by the hands that gave it to him shall you be led past fear to love. Q #420: In A Course in Miracles Jesus says: “I have great need for lilies, for the Son of God has not forgiven me. And can I offer him forgiveness when he offers thorns to me? For he who offers thorns to anyone is against me still, and who is whole without him? 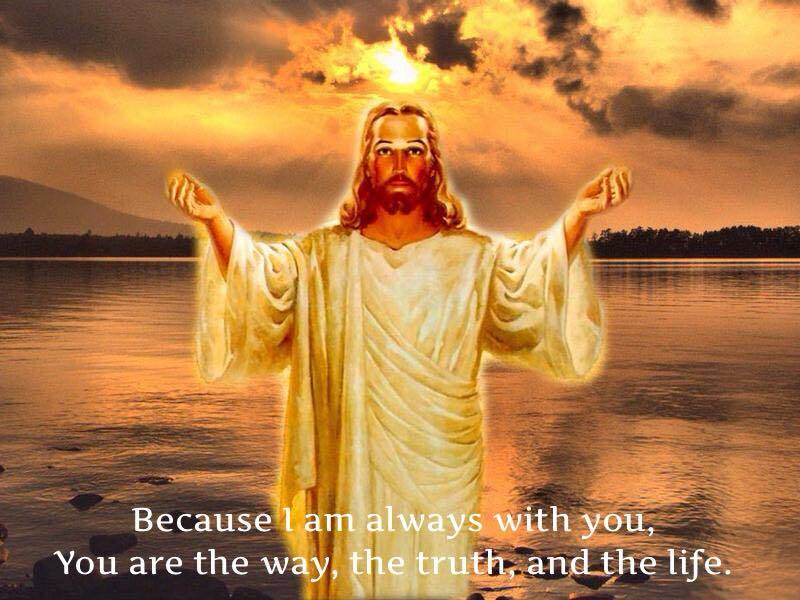 Be you his friend for me, that I may be forgiven and you may look upon the Son of God as whole” (T.20.II.4;1,2,3,4). I am not entirely sure what Jesus needs us to forgive him for. What has he done? Is it not we who should be asking him to forgive us that in our insane wrong- mindedness we were and still are mistaken about his and our identity? A: First, in the passage you quote, Jesus is teaching us again that the Sonship is one: we cannot attack another person without simultaneously attacking ourselves and him. Now with regard to forgiving Jesus… We will give a brief answer here and then suggest some references for an in- depth study of this important topic. There are two levels on which we need to forgive Jesus — all based on what he tells us in the Course. The first level pertains to our projections onto him, the “bitter idols” he mentions in the clarification of terms at the end of the manual for teachers (C.5.5:7). On the one hand, we (the world) have made him into a figure of judgment and punishment who demands suffering and sacrifice. On the other hand, we have made him into a magical savior who will solve our problems, and reward us for our faith and our good deeds. These two images, of course, are prominent in the New Testament, and have been throughout the history of Christianity. On this first level, then, we need to forgive Jesus for what he has never done and for what he has never been. This really is a defense against the more basic underlying level, which is our need to forgive Jesus for who he truly is, as he reveals himself in A Course in Miracles, thus correcting the distorted and mistaken descriptions given in most religions for the past two thousand years. If Jesus is indeed present within our minds as the reflection of God’s Love — the pure expression of the Atonement principle — then our entire identity as a separated physical and psychological being is undone. He is the living proof within our dream that we are wrong about everything, that our individual lives and the entire world are made up. He has not come to help us make our lives in the world better. When we allow ourselves to look honestly at who Jesus truly is and what he truly represents, we could not but react with fear and even hatred. So it is because of who he truly is that our forgiveness of him is needed. In this sense, we can all relate to the profound feelings expressed in Helen’s poem “Stranger on the Road,” in which she portrays her fear of confronting the truth of Jesus’ reality. Question #54 in The Most Commonly Asked Questions about A Course in Miracles; “Why Must We Forgive Jesus?” in Chapter 15 of Forgiveness and Jesus: The Meeting Place of A Course in Miracles and Christianity; The Afterword in the second edition of Christian Psychology in A Course in Miracles, and “Forgiving Jesus: Stranger on the Road,” an audio tape album.